VANGUARD ALTA+ tripods were created by photographers, for photographers, to meet the most demanding requirements. And all of this accomplished in a sleek and modern design. Vanguard's ALTA+ is perfect for air travel and backpacking. ALTA+ combines ultra stability, durability, easy of use and reliability every photographer needs. 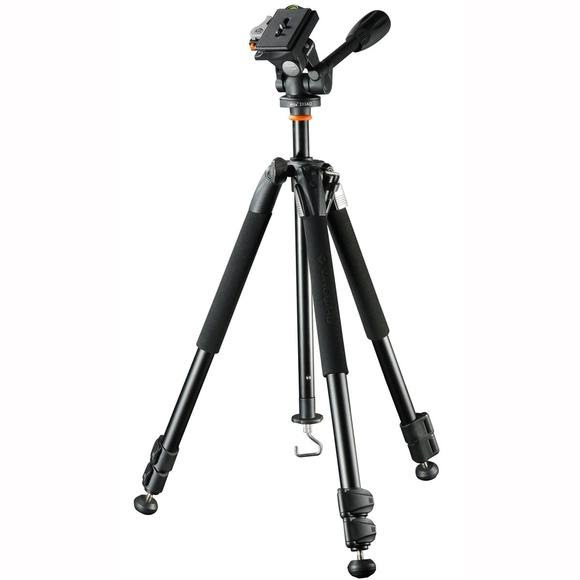 VANGUARD ALTA+ tripods were created by photographers, for photographers, to meet the most demanding requirements. And all of this accomplished in a sleek and modern design. Vanguard &apos;s ALTA+ is perfect for air travel and backpacking. ALTA+ combines ultra stability, durability, easy of use and reliability every photographer needs. Its legs adjust to 25, 50 and 80-degree angles with a simple push of easy-release buttons for easy terrain changes and low angle-shooting. Other features include advanced camera vibration and shock control, all-weather foam grip legs, patented premium magnesium die-cast canopy and head, non-slip, spiked rubber feet for changing terrains, and a removable hook for hanging camera accessories. The fluid-like pan head has an adjustable gravity center, arched design and a double safety lock. Dimensions Folded: 24", Minimum: 46 5/8", Extended: 57.125"